Solar Stallion 3-in-1 solar kit is an amazing way to educate children (and adults!) on how solar power works. It's also great brain stimulation for the mechanically minded. 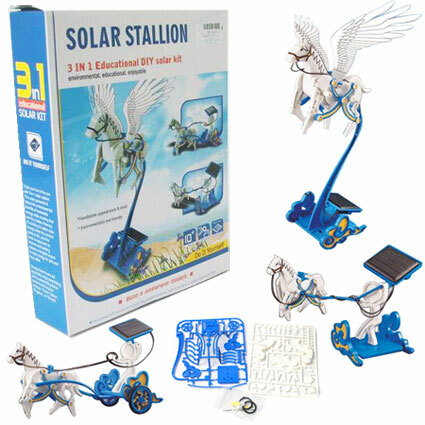 This kit comes with plastic pieces that make a solar pegasus, horse trainer and chariot. The age recommendation is 10+, but bright children who are younger will be able to do at least some of the building on their own or at least the attempt may bring them a sense of accomplishment and independence.